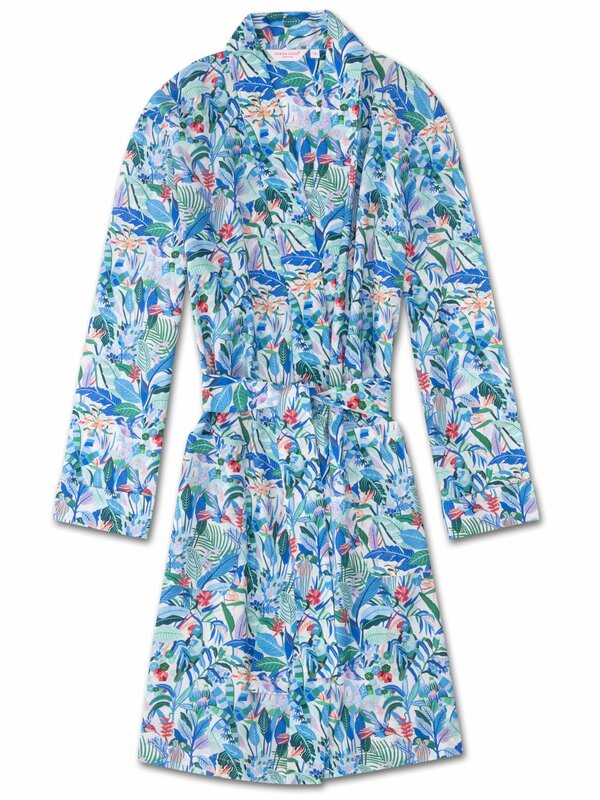 Take yourself away from the hustle and bustle of life and relax in supersoft pure cotton with this intricate hand-drawn botanical print dressing gown, inspired by Southern California wildlife including parrots, hummingbirds and a variety of palms. Designed for a relaxed but flattering and elegant shape, our women's dressing gowns will keep you looking great and feeling comfortable throughout the seasons. With its relaxed fit, you can layer this gown comfortably over pyjamas or loungewear even in summer. Made from our signature cotton batiste - a lightweight and luxuriously soft fabric that excels in both warm and cool temperatures - the Ledbury 20 knee length gown features two front patch pockets and a self-fabric kimono style collar, cuffs and waist-tie for an effortlessly stylish finish.